Provide comfort for the family of Joan Carbeck with a meaningful gesture of sympathy. Joan C Carbeck (Lewis) 83 of North Tonawanda on Tuesday, April 9, 2019 after a long illness. Wife of the late Albert C. Carbeck. Loving mother of Darlene (Garry) Burgett. Proud grandmother of Jeremy (Katie) Burgett and great grandmother of Henry David Burgett. Sister of Neal Lewis and the late Miriam “Peg” Hardy. Dear friend of Elinor Deeb. Also survived by several loving nieces, nephews and great-nieces and nephews. Friends invited to Salem United Church of Christ, 114 Morgan St. Tonawanda, NY on Monday morning at 11:00. Interment will follow at White Chapel Cemetery. Joan was a member of the Garden Club of the Tonawandas for over 22 years. She was a life long member of Salem UCC. She was extremely proud of her Grandson’s service in the U.S. Marine Corps. Memorials may be made to Salem UCC. Provide comfort for the family of Joan C. Carbeck (Lewis) by sending flowers. 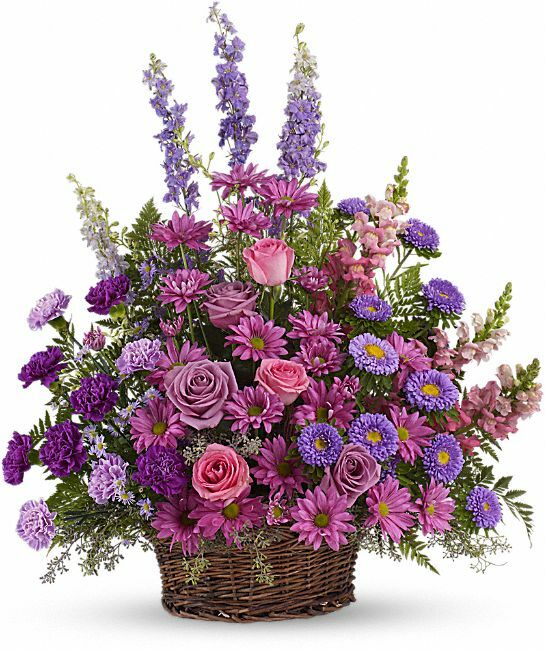 Heartfelt Sympathies Store purchased the Gracious Lavender Basket for the family of Joan Carbeck.